Keyla Garcia, M.P.H., CHES, CHWC Health Educator, is a health educator at Health Promotion Florida Blue. Keyla graduated from Herbert Lehman College in the Bronx, NY with a Bachelors of Social Work and went on to receive a Masters in Public Health from Hunter College in New York City. She has received accreditations from The National Commission for Health Education CHES, CHWC, Wellcoaches Certified Health and Wellness Coach, WELCOA Well Workplace University, Am I Hungry Facilitator, Am I Hungry Coach, National Society of Health Coaches Health Coach, AHEC Quit Now program facilitator and American Lung Association Freedom from Smoking certifications. She has received recognition in the community and awards. Keyla has over 10 years work experience in the healthcare field with families, patients, adolescents and community. She has worked with many populations targeting health promotion, cardiovascular disease, geriatric, mental health, AIDS, and Cancer. Presently, her interest is in health promotions. She has facilitated bilingual breast, cervical, prostate, nutrition, diabetes, blood pressure, smoking cessation programs and other education workshops in West Coast and South Florida. She participates with Florida Blue team activities and performs outreach efforts including program planning and evaluation. This includes taking part in health events such as planning health presentations and wellness initiatives in West Coast and South Florida. 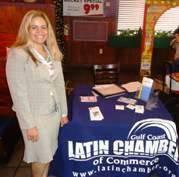 She has participated in Public Relations, Marketing health events and activities for the community. Ms. Garcia is also a native Spanish speaker.